A lovely apartment (70 square meters) in the very heart of the ancient, picturesque Trastevere. 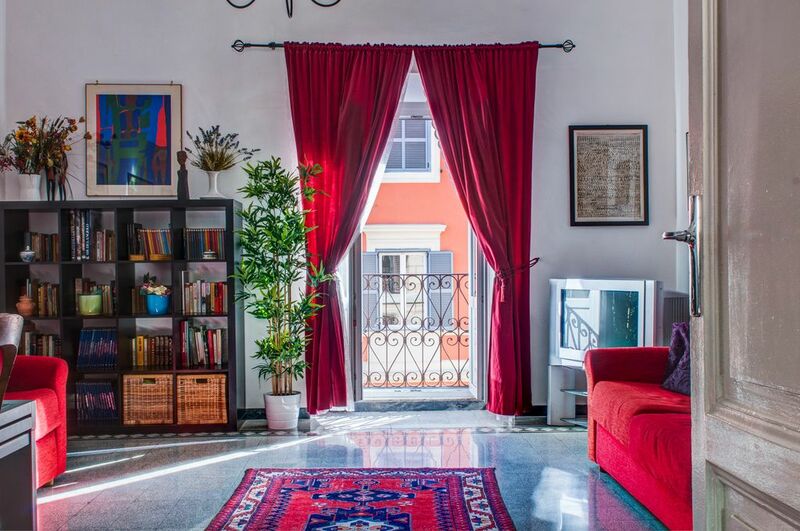 Located at about 400 meters from Santa Maria in Trastevere one of the most famous Roman squares and a few steps away from the lively piazza San Cosimato with its open air market. The apartment is conveniently located just a few blocks from John Cabot University, making it a convenient solution for friends, families and teachers. Guests can easily reach such historical sites as St. Peter's Basilica, the Spanish Steps, Trevi Fountain, Borghese Gardens, Navona Square and many more, plus the Gianicolo Hill for an unforgettable overview of the whole city. The following amenities can be reached shortly: transport (bus, train to/from Leonardo da Vinci airport); pubs, restaurants, wine bars, pizza huts, etc. ; Internet points; tourist information points; food shops and drugstores; dry cleaner; pharmacies and hospital. On fourth floor with elevator. Main bedroom with king size bed and epoque wardrobe. A living dining room with two sofa beds. A bathroom with shower, hair drier, washer and ironing. Crib, child seat , sdraiette ,basin for baby bath available on demand. This was a perfect apartment for our family of four. We were lucky to spend 9 days in Rome and the apartment was great. I couldn’t recommend more. Don't Think Twice About Booking! We traveled all around Europe and this was our favorite place to stay. Chiara provides so many personal touches and keeps the apartment spotless. It is so welcoming and lovely and feels like you are in your own home. Also, if you want to get away from tourists and get a taste of local life, this area is the best. So many restaurants and streets full of energy and fun. Highly recommend! It was a real pleasure to have the chance to know you and we really hope that our apartment was a contribution to have a good memories about this trip. I hope to see you again in the future, keep in touch with us when/if you return to Rome,you will always be welcome. The PERFECT place to stay when you visit Rome! I can not recommend this apartment enough. This is a 5-star place in every way! It is clean, beautiful, and comfortable. The location is great. You can walk to so many sites from here. The hosts were great. They were responsive and easy to work with (not that we needed anything - there were no issues). The apartment was well stocked with coffee, tea, bread, lunch meat, etc. A welcoming bottle of wine and fruit tarte was waiting for us when we checked in. This truly is a great place to stay. A sparkling clean and well equipped apartment in the beautiful Trastevere area. Our daughter is studying at John Cabot University and this was very close by the University and many other neighborhood delights. Amazing food in the area. Our host Chiara was wonderful. We booked a car service to the apartment from the airport with her. Our bags were lost for two days and she assisted us in getting the bags so we could still be out touring and enjoying Rome. We arrived to a homemade tart and a bottle of wine. The apartment has two bedrooms, one w a queen and one w a twin. A large living room with two nice queen sofa beds. The neighborhood is very safe and makes for a great base of exploration. I would stay here again in a minute. You should also! This is the place!! A fantastic friendly host. A great location. A well organized clean apartment. Book and you won’t regret it. We cannot thank Chiara and Massimo enough for providing not only a great apartment to return to after our lengthy adventures of Rome, but also for assisting us when needed throughout our trip. The apartment was comfortable and contained everything we needed for our stay, including complementary wine (which was gratefully received and enjoyed). It was within easy reach of the best gluten free places to eat in Rome (Fatamorgana and Mama Eat), as well as a number of wonderful sites. It's a short tram ride to the Pantheon and the Feral Feline Torree Argentina Cat Sanctuary. It's a 2 minute walk to Piazza di Santa Maria in Trastevere (perfect for night market and a passagiana), and so close to Giardini degli Aranci (go to watch the sunset) and Orto Botanico, you'll never run out of things to do. It's such a beautiful city, and to return to this apartment at the end of the day was wonderful. Thank you so much for letting us stay. And it was great to meet Maya and Chanel! Vikki it was very nice to have the chance to meet you and have a little chat with you. We are glad that our apartment was a contribution to have a good memories about this trip in Rome. We want to say thanks to have left the apartment in impeccable condition. The property exceeded our expectations in regards to size and emmenities. Our host was very gracious and had the place fully stocked with toiletries and even some food to get us started. The apartment is situated in a quite neighborhood that is within walking distance to all main attractions. As a family of 4 we had plenty of room to spread out and the kids had their own beds. We were very pleased with our stay. Payment 50% by credit card , the remaining 50% preferably cash upon arrival. Nightly Rates: E 110/140 for 2 guests, PLUS 10 Euro for each additional guest.. Extra charge of 30€ for check in after 8:00 pm. Local taxes 3.50 Euro each person a day for first ten days(to pay cash).